We manufacture a wide range of LP And HP Pallet Wrappers 1 which are of superior quality and in accordance with international quality standards. These wrappers can also be customized as per the specifications of our clients. We offer these wrappers at most competitive prices. 1st time in INDIA Small Table-type Shrink Wrapping Machine Now Gift packing become more easier with so compact and heavy duty shrink wrapping machine, which gives dust proof, moisture proof, esthetic look packing to your products. We manufacture custom made Pallet Shrink Wrapping Machines to the market. These machines are known for their top notch quality and are utilized for Shrink Palletizing the products providing high degree of moisture and dust protection, for Sea worthy transportation. - Models available in speeds upto 35 packs per minute. - Sealing by constantly Heated Hot Knife and Automatic film Unwinding. 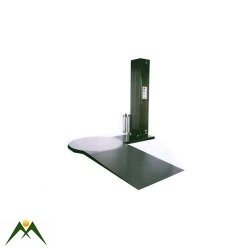 - Suitable for Collating Bottles, Tins, Containers with / without Mono cartons. - Sealer Size 15" X 20" or 20"X30"